Have you dreamed of designing your own jewelry? transform your idea into reality. The availability of loose diamonds Dallas and Fort-Worth TX, today is better in quality and selection than it was 15 years ago. In the past, consumers were at the mercy of what the retailer chose to carry. Today, the diamonds consumer is savvier and the industry has to change. In Dallas, Texas we have seen the loose diamonds consumer become more educated about diamonds and what it would mean to select the diamond themselves. Because of the growing interest in diamonds, shapes that were not carried as regular inventory in the brick and mortar stores are having a greater interest. The radiant, asscher and the cushion cut diamond we rarely asked for 20 years ago. We are sure the internet had much to do with it. Regardless, the consumer has raised their expectations to retailers and wholesale jewelers. Unfortunately, retailers appear to be behind to the demand that consumers are looking for. Here in Dallas, Texas, we have to be ready with 10 different shapes: Round, Princess, Cushion, Emerald, Asscher, Radiant, Oval, Pear, Marquise and Heart shape. The fascination of looking over many loose diamonds is wonderful and more helpful in the decision process than having them mounted. When the diamonds are set in a mounting, it is not possible to evaluate or grade the diamond accurately. 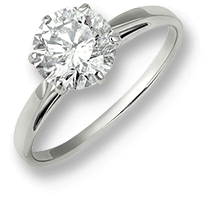 The setting may influence the color of the diamond and the setting may obscure inclusions that will correctly identify the grade it has been given. Reputable diamond certification companies will not grade a diamond unless it is loose. 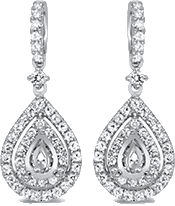 Most retailers will have mounted diamonds that are picked from a presorted selection of inventory. Too few diamond consumers discover the luxury of being able to select your own diamond. Perhaps it sounds too difficult. As a wholesale jeweler, we assure you it is not. In fact, it is easier. You can see more of the diamond, because you can control how and what you see within the diamond. You can magnify each diamond 10x and see each and every facet of the loose diamond. This is a valuable part of the ring shopping experience. In Dallas, Texas, our customers found it easier to control their budget by looking through a large assortment of diamonds and finding one that fits the shape and style of the ring and their budget. 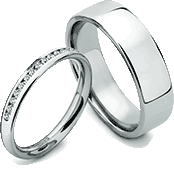 The selection of a diamonds is a personal way for you so show the person you love your devotion to your relationship.